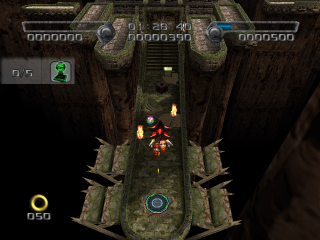 Glyphic Canyon is one of three possible second levels of Shadow the Hedgehog; in the game's branching path structure, it follows from taking the morally neutral path through Westopolis. An ancient ruin site set into the sides of a yawning chasm, Glyphic Canyon is assaulted by the Black Arms in an effort to activate the long-forgotten power cores buried within the temples. GUN forces scramble to hold back the invaders, assisted in their defence by Knuckles the Echidna, presumably caught in the crossfire during one of his periodic treasure hunts. Because of the age of this place (over 2,000 years according to Black Doom), many parts of the structures are weak and pillars will fall around (and can be knocked over by) Shadow, as well as the many smaller pillars, rocks, and walls which can be broken with a punch from Shadow or Knuckles. Overall, the stage is covered in sand, probably tossed about by the numerous active tornadoes in the stage. Scattered about are small torch structures, which can be broken and utilized as melee weapons. Having stolen the two Chaos Emeralds from Westopolis while ignoring both Doom's Eye and Sonic's entreaties, Shadow is confronted by a hologram of Black Doom on the city's broken streets, enraged by his intransigence. Doom muses that "perhaps Professor Gerald has done more to your memory than I imagined", referring to the scientist's reconditioning of the hedgehog after Maria's death. All of this is beyond the ken of a still-amnesic Shadow; Doom responds to his sudden spark of curiosity by Chaos Control teleporting him to Glyphic Canyon as punishment for his disobedience. Shadow senses activity in the area, and proceeds to investigate. After a short run into the stage, Shadow will come across Knuckles the Echidna, who wants help to 'get rid of these annoying aliens'. Still further into the stage, Shadow is once again faced by Doom's Eye, and is instructed to touch the five jewels around the stage and reawaken the temple. With or without Shadow's help, it seems that eventually, Black Doom manages to activate all the temple jewels. Reawakened, the temple ruins are able to levitate, and are used by the Black Arms as air assault craft during the invasion. Later in Sky Troops, Shadow plunges into a stratospheric battle between the Eggman Fleet and these Black Arms ruin-ships. The Secret Door is located past the 5th checkpoint. Using light dash to get across the gap and bouncing off the springs puts you on a path with the door at the end. This page was last edited on 2 March 2018, at 12:30.